Hotategai, or Scallops, is another worldwide favourite and also a source of dispute caused by illegal poaching, international or domestic. 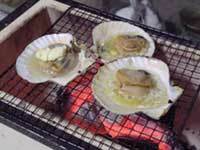 The season is summer and the shellfish is sometimes called Akitagai, as of Akita Prefecture. They are caught off Hokkaido, Aomori, Iwate and Miyagi Prefectures. 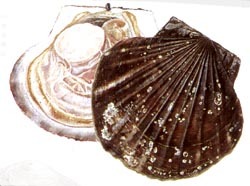 The domestic production/catch is over 300.000 tonnes a year, while 400 tonnes are imported from China as whole Scallops and 700 tonnes as the muscle part only (“kaibashira”). Japanese scallops will be significantly larger than the Chinese. Actually, a good-class sushi restaurants will serve the muscle part as sashimi or sushi, and will serve the rest of the shellfish cooked in light brothe inside the shell later! The “coral” on a scallop? Should it be eaten? A famous cook – Jennifer Paterson allegedly said it should. I love fat tall scallops, flash fried with a crisp coat and a sticky moist interior. Definitely agrre with you, Barnaby! BUT the Japanese, for some unfathomable never eat the roe (red egg pouch) raw, but either fried or steamed! In France, we mix it raw with herbs and use it as a topper when you grill scallops!